Yesterday I mentioned that there would be a roundtable hosted by EMC on The Emergence of Private Clouds – A Roundtable Discussion with Industry Experts. The experts are Stephen from VMware, Chad from EMC and Doug from Cisco. The recording is out, if you register you can probably get a link to it. The verdict is its worth the time. Here are my simple notes of the types of things discussed. I occasionally remembered to mark the time of the recording as well. How IT is run rather than where, giving you the freedom of choice. Virtualisation an enabler for cloud, allowing you to move between data centers. Removing the penalty of application rewrite. Non-disruptive disruptiveness. A discussion around the assumption that things need to be virtualised, what about high end loads and the non-x86 environment. A discussion on centralized desktops in your data center in your private cloud, whilst being able to take it offline into your local device. Discussion on Cisco UCS for delivering all those virtual workloads. Provisioning networks in software rather than in hardware. The change in organizational models with the lines between network, server and storage teams changing. The precursors of this are occurring now, for example when trying to implement BCDR with SRM. The VM is the new atomic unit or building block of the datacenter. It breaks how we build networks, how storage moves. Seeing many things now being built around this new atomic unit. Interoperability is becoming pervasive. 24:00 A discussion on service providers, how big will they build, the choice it brings and new pricing models they bring. Service providers are evolving from hardware to software providers. There is a lot of work to do to broaden out the use cases. People want migration between the private and federated clouds which may require lots of data movement. How do you bridge the DC with layer 2? Not for all workloads but some. Expanding the security model out into the external cloud. VMware, Cisco and EMC are working together on the hard problems which will surface in the future. 32:00 Where does Green IT fit it? What are the barriers to adoption? Moving from manual to automation, look at the change in DRS automation. Knowing your data is protected and highly available. Running your infrastructure the way a service provider would do it, quality services at a flexible price. VMware have given support for the Open Cloud Manifesto. VMware Director of Standards Architecture, Winston Bumpus, put out a post today detailing some of the standards activities he is working in for VMware. VMware supports the idea of cloud standards and has already made good progress on some key pieces. As one of the original authors of the Open Virtualization Format (OVF) specification, VMware has already shown its leadership and support for working with the industry to drive interoperability standards. In fact VMware believes that interfaces should be open so customers can have choice and improved interoperability while service providers can differentiate on functionality and performance of their services. VMware agreed to be part of the Open Cloud Manifesto. This document and discussion, while providing a very minimal set of principles to agree upon, will form a basis for initial agreements as the standards for this new computing paradigm are developed. We don’t believe there will be a single standard or standards body that will standardize all aspects of cloud interoperability. Of course Microsoft voiced concerns regarding the process and possible outcome which they detailed. Microsoft are not listed on the signatures page of the Manifesto. Its good that at this stage of the cloud development we are seeing intent for standards and a dialog. Also great to see so many cloud posts from VMware in the last few days! This one is more of a heads up. There is an round table today that will be worth listening too. Don't try registering to attend as its already full. Would have been nice to see VMware advertise this somewhere a bit earlier. Could not find any details in any of my RSS feeds but thankfully someone tipped me off (thanks Tim!). If you do register you can get a link for the recording. Once I get the recording I will let you know any good details or if its worth listening to. Given that the speakers are Doug, Stephen and Chad it should be really good! For an example of something probably not worth it, there was a webcast last week from VMware "Protecting Confidential Data in Cloud Computing Environments" which was woeful. It was on at 5:00am my time and to me it missed the mark and would have been better described as "Security in a essentially traditional shared VMware environment but it sounds cooler if we put the word cloud in there". Please don't send me hate mail, see for your self when the recording appears in the webcast section of the Cloud Resources tab on the VMware site. Very excited to see what the discussion in this latest round table is though. Should be great. Update : I did find an announcement 30 minutes after this original post, it was on Chads blog (which is aggregated into Planet V12n) but it did not appear in my search as it was brief and did not have the keywords in it I was looking for. Still stands though, VMware should have advertised this a bit more. One of my 5 steps to prepare for Cloud is to understand your current cost model. After all, how are you going to know if the cost of a new service is attractive if you don't know what your current costs are? What will the costs models of the new cloud services look like? Well many are yet to be seen but a large difference we are already seeing is moving from a fixed cost, whether that be monthly or annual to a consumption based pricing, only pay for what you use. Consumption based pricing is of course nothing really new, its has been around in many areas for a while, such as hosted storage or carriage. Although a slant on cloud based consumption is that it is not pre-provisioned. Yet the consumption based pricing was one of the more visionary elements of Amazons EC2 service. Pay by the hour or pay by the Gigabyte. Thats they way people want to consume cloud services is what we keep hearing, pay-as-you-go. Therefore it was interesting to see that this month Amazon introduced an additional pricing model, its called "Reserved Instances". Reserved Instances give you the option to make a low, one-time payment for each instance you want to reserve and in turn receive a significant discount on the hourly usage charge for that instance. After the one-time payment for an instance, that instance is reserved for you, and you have no further obligation; you may choose to run that instance for the discounted usage rate for the duration of your term, or when you do not use the instance, you will not pay usage charges on it. Reserved Instances can be purchased for 1 or 3 year terms, and the one-time fee per instance is non-refundable. Usage pricing is per instance-hour consumed. Instance-hours are billed for the time that instances are in a running state; if you do not run the instance in an hour, there is zero usage charge. Partial instance-hours consumed are billed as full hours. So you can have pay-as-you-go or you can get a discount by paying in advance. People have even done the calculations to determine where the change point is to swap to the prepaid model. Sounds like the new pay-as-you-go model may not be as great after all if the old model of longer term contracts can bring the customer cost savings and the supplier some more predictable revenue stream. What might the future hold for cloud pricing? I think the mobile phone market is a great example of where we will end up; too many plans which you can't really understand and compare, many different means of bundling and packaging. Pre-paid, account, big packages with large usage amounts included or small packages with hefty additional usage fees. Where might this all end up? The day will come when the cable into your house will offer a number of different services. Today that cable offers television, telephony and internet services. Tomorrow it will add another service, compute resource, so you can throw away your home PC. It may not even run over Internet protocol, but some new remote PC protocol. You may get an amount of compute resource free as part of your package and then you pay-as-you-go for additional usage (one for each family member). I think the pricing models for cloud are going to get a little crazy, so you had better get ready and work out your current cost model in order to see how they all stack up. Steven Martin from Microsoft has detailed some good information on Azure in two postings (1, 2) in the last few weeks. I recommend reading them but let me pull out one particular area, in regards to private and public clouds. Over time, the innovation in Windows Azure will be cross-pollinated with our on-premises server products and Windows Server, offering increasing capability to transition workloads between on-premises and the Azure cloud. Driving a consistent approach across both premises and cloud technologies ensures that developers and IT professionals have the power of runtime choice and the freedom to change their minds between running workloads on-premises, the cloud, or a hybrid of both to best fit their needs. Windows Azure innovations are being shared with the Windows Server code base. Down the road, many features that drive our cloud fabric in Windows Azure will land in our premises technology, including Windows Server and System Center. So, to net this out… While Windows Azure isn’t something we will license for premises deployment, we will license many of the innovations via future versions of Windows Server and System Center. So here is my thoughts on this. Its a different platform between the private and public Microsoft clouds. Some of the code from Azure will filter back into the Enterprise space, sometime down the road. No party outside of Microsoft is going to get access to Azure. Even Microsoft realise that a consistent approach across on, off and hybrid premise clouds offers power and freedom of choice. This all sounds quite complicated and cloudy. How does an Enterprise prepare for all of this? What upgrades and new requirements are their going to be if you want bring some of these Azure technologies on premise, looks like quite a bit. How will the workloads need to be changed to move between the two? Contrast this to the VMware approach. Everything is based on VDC-OS, the same workloads you execute in your private data center as you would in the cloud. The packages are wrapped as vAPPs (extension on OVF) an open standard. The glue, vCloud API will be available to many, most likely even internally for a total private cloud implementation. Thats a stark contrast to some components for some and some components for others, some integration into possible future products and resulting upgrades to your internal systems. As a way to move to cloud I know as an Enterprise which I would be a lot more comfortable with today. I am getting quite excited about the possible extensions that might be able to be made to the vCloud API. I think the metadata in a vAPP is a game changer if its combined with being able to extend the placement algorithms in vCloud API. Take this example conversation I had with a large enterprise the other day. They have over 60 data centers around the APAC region, if all of these form part of a large federated cloud fabric, workloads (vAPPs) can be place based on the available metadata and algorithms. The algorithms may be based on latency, cost models, service levels, capacity. Then I was asked, well does it cover regularity requirements or data protection laws. My answer was probably not in the first instance, however, imagine a time where you can define your own metadata for your vAPP, such as data privacy requirements, and you write your own decision algorithm to be loaded into the vCloud API placement algorithm. Sweet, you can now place your workloads based on your own criteria. Try doing this with Azure, I think not. I can see the day where this will be not only possible but easy with vCloud. Certainly not today or tomorrow, but not that far off. Enterprises have some hard decisions to make as they investigate the cloud space and the offerings from the vendors. Don't misunderstand my musings, Azure will have a lot to offer Enterprises and many will take up some of its services. What it is not though is an architecture for running your future data centers, which is really where VDC-OS really measures up. Its probably not even fair to compare the two, but hey if everyone else is, including Microsoft, I might as well do it too! VMware have revamped their Virtual Appliance Marketplace. The whats new page details the enhanced account management and improved content. There is now also user generated content. Details of this update first surfaced back in October 2008. 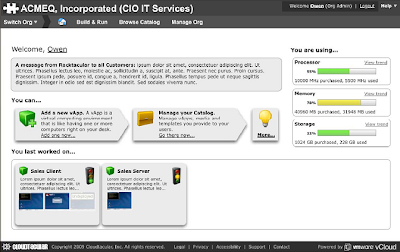 Back in December 2008 I put forward the view the Virtual Appliances are important for VMware in the SaaS cloud space. The challenge for VMware here as well as the opportunity is to capture some of this space with Virtual Appliances. 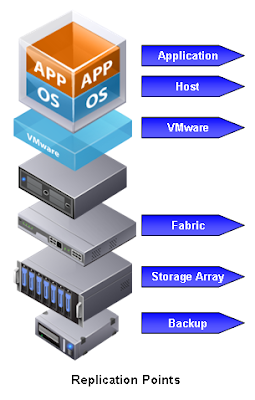 If a mature set of Virtual Appliances can be available through the market place; if these can be downloaded from within the management environment painlessly; and if they can not only describe their service levels, backup and disaster recovery requirements (vApps) but also implement them automatically (AppSpeed, Data Recovery Appliance, SRM) VMware could be onto a good slice of this pie. Put your credit card in, download the service and run it locally in your own security model, owning the data. You can even still have the provider maintain the application as part of a maintenance agreement. Most of the benefits of SaaS without many of the current concerns and limits. VMware need to lead by example here. Hence its great to see this update released. Now VMware need to encourage more developers and and ISVs to produce high quality Appliances to deliver a SaaS layer on top of VDC-OS, giving customers the choice and flexibility of where to execute their workloads. Australia seems to be enveloped in a cloud these days. You can't start a conversation without it turning to cloud, or maybe thats just me. IDC brought out some interesting facts of a recent APAC survey they conducted in June. Here is a little summary. Like VMware "IDC expects its adoption to be amplified by the cost-cutting mantra of most organisations today." In fact "50% of the respondents indicated cost cutting as the key driver behind the adoption". 11% of those surveyed are using cloud services now and a further 41% are piloting or evaluating its use. Thats means more people are interested enough to be doing something about it than those that are not. For the crossing the chasm thinkers the next three years will see cloud moving from early adopters to early majority. The research was conducted by Linus Lai (pictured), Associate Director of Research and Consulting at IDC Australia. I have met with Linus and discussed his research and I must say he has some good insights into cloud and its definition. Linus and IDC are presenting at their cloud conference on March 25th, which I recommend people register for way back in December. Turns out it has been so popular that they are pulling prior registrations for anyone in the partner or vendor community, like me! So if you can get it, call me whilst you are there and fill me in! As the new moderator on VI:OPS I am writing two documents in the VI Blueprint. The first one is the BC/DR workshop. Currently we are detailing out the outline. I have been architecting DR solutions for a few years and its a real interest area. Therefore its great to be authoring with some other skilled people a good reference document. If you are interested in what we are doing you can read the gory details of the structure we are putting together and even contribute if you want. I thought I would post just one of the things that will go into the workshop, details about replication points. Have you ever wondered about how to get data over to your DR site. Don't forget there are three types of data as well , their is your OS, your applications and the actual application data. The diagram above shows the various replication points available to you. The workshop will detail the 6 different replication points, giving some pro's and con's for each along with the vendors and some links. In general as you move down the layers your granularity and application awareness is reduced. So all you VMware geeks, where does SRM sit in these layers? Post your answers in the comments. Will post more as the full workshop content is completed in a few weeks. The guests are Brian Pinkney, technical support manager and Mostafa Khalil the tech guy. Different levels of Gold, Platinum and BCS (Business Critical Services). Everyone is entitled to "live answer". VMware are starting to use severities to priorities incoming calls. Severity 1 - Mission critical application down, you are at significant risk of data corruption and loss. Business operations are severely disrupted. Severity 2 - A major functionality is severely impaired. Severity 3 - Partial, non-critical loss of functionality of the software. Severity 4 - General usage questions, documentation or cosmetic issue. Sometime support gets calls from people doing an install asking for someone to walk them through it. There is a team who take support questions from the partners such as HP, Dell, IBM. If your support is with a partner you don't have a contract with VMware and can not talk direct to VMware. Partners have a number of free support calls provided per year, details of which can be found in Partner Central in "Information Center -> Support". It can be frustrating when a technical support staff member question asks for information which is not relevant to your issue. For example if you just want to know if a HBA is supported on a particular version and they then ask for your configuration and logs. They are working on keeping the support people listening to the question. When you call in the more information you provide as the call opens helps them know how to route it to the most appropriate person more quickly. Especially if you log a request via the web the statement "I am having troubles with ESX can you help" is not that helpful. Anticipate for any future issues by preparing. Collect your logs on a regular basis by running VM Support. For 3i use the VMI appliance and forward the logs into it so you have a history. Run vm-support on a regular basis. It helps with tracking configuration changes or data loss. You don't need the service console to troubleshoot 3i, which can be a misconception. The advanced trouble shooting and advanced logging analysis sessions from VMworld have a lot of details. Mostafa asked if people were interested in a call home feature like SANs typically do. For the security conscious this could forward to an internal proxy server which then forwards onto VMware. Does VMware have a plan here? Host profiles in VI4/vSphere were mentioned. They can be a good method of backup for your servers. You can collect the VC logs as well as the ESX logs which is performed via the VI client. Redundacy of your service console and kernel ports. The role of Technical Account Managers (TAMs). These can be an additional advocate within VMware, being on top of tickets, getting the right expertise on them, setting expectation with customers. They also have a good understanding of the customers environment. How to escalate a ticket? There is an official escalation process. There is the “first line”, the “research” and then the “escalation engineers”. If it’s a technical issue it gets passed up as the engineers run out of technical skills or understanding. For the non technical escalation, such as when there is a disconnection in urgency or response, if you are not connecting properly, playing email/phone tag, if the case is dragging and revisiting things over and over then call the support center and ask for the "duty manager" and give them your ticket number. They will attempt to prod or kick it along or possibly get it reassigned. Everything you could ever want to know about VMware support can be found in the VMware Technical Support Guide. For those who may have noticed the announcement or have followed the relevant links to here I have been welcomed as the first ever moderator of the VMware VI:OPS website. As the February update states. We would like to welcome our first VIOPS moderator Rodney Haywood AKA Rodos. Rodos will be assisting the VIOPS community in various ways by editing and approving various documents and answering various questions throughout the site. Our new moderator, Rodos, has also written his first comprehensive proven practice on the popular them of migrating from physical servers to virtual machines. Recognizing that this challenge is more about a well planned and executed process rather than which tools you use, especially when working to scale, this document is a true fountain of knowledge. It is a privilege to be able to assist with what I think is an important development of the virtualisation space as it continues to move into mainstream operations. For the next set of adopters operational and proven practices are just as important as speeds and feeds of hypervisor performance. My thanks to Steve Chambers and the VI:OPS team at VMware for their trust. If you are interested in disaster recovery I am tasked with developing the VI3 Business Continuity and Disaster Recovery Workshop followed by the VI3 BCDR Architecture and Build Guide. First of the rank is the workshop. If you have some ideas into the content of the workshop then post your ideas into the workshop document development thread where we are collaborating on the content for the draft document. Of course for all of you VMTN fans, their is no doubt that communities will continue to be the place for community assistance and discussion on technical and product topics. However over time VI:OPS should develop into another quality resource for the operational and management staff who are looking for more detailed information to make their adoption of virtualisation easier for themselves and their organisations. Why don't your drop on in and post a welcome message whilst browsing some of the current content. You never know, you may see that there is something you can contribute. P.S. After becoming a vExpert last week don't expect anything next week, I am having this weekend off! An article in the Australia IT press reveals that a government department is trailing what looks like VDI combined with ACE. The article "'Log on anywhere' system on trial" is from Australia IT News. The use of ACE. This is most likely providing the View client. I wonder if its also virtualised with ThinApp. It also looks like the View secure gateway is not being used as it states that a virtual private network is being used. It operated fine from Jakarta. I did a basic ping test to Indonesia and it looks like 160ms, which is close to the noticeable 150ms latency for remote access. It was approved by the secure hats at the "Department Signals Directorate". They cite issues around accessing video and PDFs, the two examples I always use when discussing remote access with View. They don't say if they are using TCX, but using this remotely is going to be a challenge. By virtualising the department was able to reduce staff as natural attrition occurred. They were able to support peaks in demand, such as during census time. Can anyone else see the opportunity for federal departments federating their internal clouds to cater for peak load of each other? They were able to right size the resource allocation, and when it was different to expected they were able to adjust resources easily. "... but found the load was heavier than estimated. We were able to allocate double the resources to each of those servers." That sounds better than over spec'ing all individual machines just in case. The Australian Bureau of Statistics has 95 percent of its servers and applications running under VMware. Given this is our top number crunching agency (okay, maybe behind the tax office) who says you can't virtualise higher end work loads. Its all very standard stuff to us virtualisation evangelists, there is no rocket science here. However when you stand back and look at what can be achieved for an organisation such as the ABS, it really makes sense as the best way to operate IT in 2009. 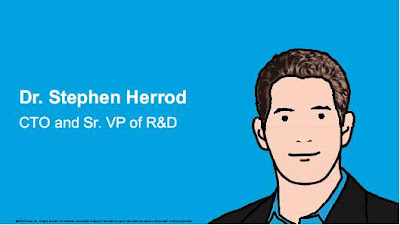 On day 2 of VMworld in Cannes on the 25th of Feb, Stephen Herrod, the CTO and Sr VP of R&D at VMware gave his keynote speech and slidedeck. Stephen covered three topics, here are the timings. You can see by the timings which products are more developed, only 11 minutes on vCloud. So what did Stephen have to say, here is a loose transcript, its not word for word, but close. A world of Internal an External clouds. Using a variety of techniques to bridge these together to provide a private cloud. The vCloud API enables 3 specific things. Federation. How do we connect multiple internal clouds together as well as external ones. Management. How do we progromatically take control of these resources no matter where they happen to be. Interoperability. Allowing you to move between these and not get locked into one particular implementation. The vCloud APIs are restful interfaces which are now in private release but will be release more broadly this year. Connecting multiple data centers together. VMotion and VMFS are the tools used internal to a cloud but a different set of tools will be used between clouds. Four areas being focused on in the Federation front are Security, Networks, Storage and Monitoring. Between clouds you need to be sure you are secure as you leverage different resources. How you are going to route traffic as you are brining up things in different places? How to maintain a network quality of service? How do you allow an application to get to its data wherever the compute or the storage actually is? How do you move around big virtual machines? How do you monitor this and ensure that your SLAs are being met? The first version or example is Site Recovery Manager. Connecting at the storage side with SAN array replication and at the Virtual Center level comparing and sharing policies via the SRM run book. Can we move things live between data centers? Long distance VMotion. Some are doing it today but it takes a skilled workforce and fairly exotic setups. We want to make this more mainstream. Will be used more between internal data centers. Working with the echo system to resolve the challenges of moving the memory of the virtual machine, moving the disk image and maintaining the VMs network connections. De-duplication and WAN acceleration are important here, extending layer 2 across sites. Not looking at global load balancing but at short or ocean distance. Planned downtime for a data center or a full data center move. If you know a hurricane is coming you can move data centers. In the desktop space if you are using a follow the sun typology moving your desktop even closer to you to have better latencies. Simple programmatic access to different resources. Two examples. Cloud vendors have created portals for creating VMs, spawning them off and start running/monitoring them. What we will be doing is creating a completely customizable self service portal to allow others to pick this idea up and run with it very quickly. For the external cloud providers customizable, certainly from a branding front, but every provider has a different from of authenticaion and billing, so it needs to be very flexible in how it plugs into those. We are basing this technology on lab manager which has provided self service test and development labs to customers so far. Its a strong foundation to build upon. Internal admins, how can you look at your workloads. Bruce comes on stage to discuss the vCenter vCloud Plug-in. Lets us manage a broader range of workloads, clouds internal and external. It manages the authentication information for each of the different surfaces. You can add in another cloud by providing your credentials which can add a whole pile of capacity on which to run. Can drag an application from the internal to the external cloud. Can manage the cloud based VM doing such activities such as power on. This plug will be seen this year. Having compatible cloud providers. Having a simple way to send machines places and powering them on. For the workload you are moving using OVF which describes the machine and some of the policies which go with them. Differentiated clouds which are more compatible than not. A broker model could come into play to broker based on some criteria. The new elements since VMworld in Sept 08 is that Lab Manager will be used for some form of self service front end. As Mike Dipetrillo announced the beta application is now available for the vCloud API. Lets keep our eye on the cloud. VMware has started to speak on cloud. In an article published Thursday at Virtual-Strategy, entitled "Where Virtualization Meets the Cloud", VMware Director of Product Marketing for Cloud Computing, Wendy Perilli, gives some of VMware's view. There you have it, a nice short definition from VMware. There is no new insights into internal or private clouds, they are mentioned but not detailed. The main thrust is that virtualisation enables the cloud, delivering the answer to the "so whats changed" question from the older days of the xSP models. Its a soft start, but I suspect its written for a certain audience. Great to see materials coming out from VMware because as I commented a short while ago, everyone else is talking cloud whilst VMware have been whispering.